I've been stuck in a creative rut lately. Mostly I blame my lack of effort and motivation, but even when I do put the time into making something nice, the results are rather blah. That means that my friends and loved ones have been on the receiving end of plain undecorated cakes, awkwardly gift wrapped presents, or odd-looking greeting cards. Not the worst thing in the world, all things considered, but it's always a nice feeling when you can deliver a kind gesture with a good first impression. 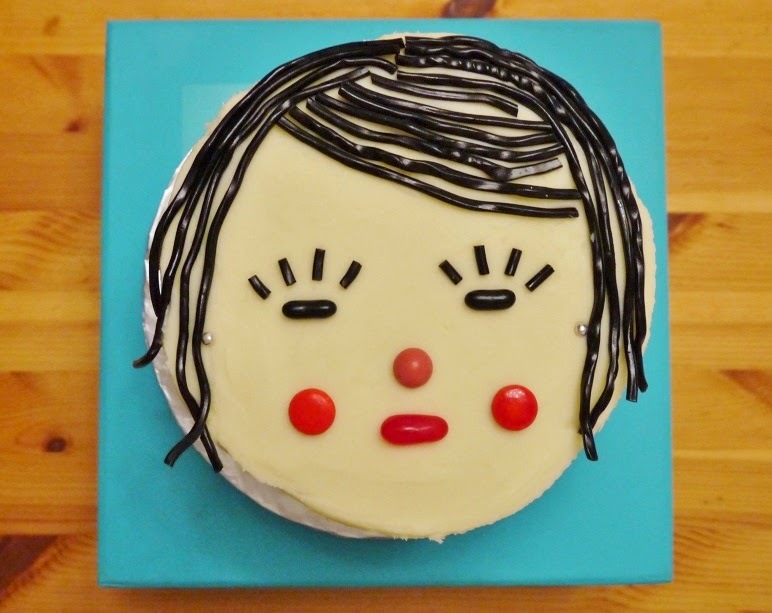 So when I saw these candy decorated face cakes on another blog, I was inspired. I really love Erin Jang's illustrations and designs: colourful, simple, and humourous. Heck, I don't even know if those are cakes in that photo, or what, but I did know I needed a cake decoration idea for a co-worker's birthday cake. I used an assortment of candies from the bulk store to make a facsimile of my co-worker's face. It honestly doesn't look that much like her, but it made her smile. is that licorice for the hair? Thanks! Yes, black licorice hair. Makes for a very decoration job... just buy and apply!